The following interview appeared in the premiere issue (1998) of Deadbolt Magazine, a dark fantasy and horror magazine published by Jim Lay. My story, “The Rescue“, appeared in the same issue. The interview was conducted by Jim through email, and I responded in kind. At the time of the interview I was still writing full time, but mostly ad copy as a freelancer for various agencies. Deadbolt Magazine is no longer being published, but this interview is reproduced here with the generous permission of Jim Lay. 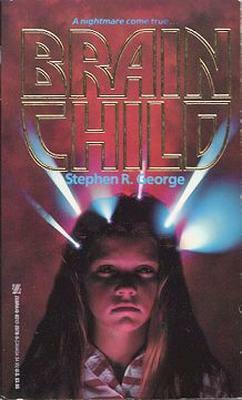 DEADBOLT: Your first novel, BRAINCHILD, was published by Zebra Books in 1989. Could you tell us a little bit about that first sale and the events leading up to it? S.G.: In November of 1987, I decided that I had to make a serious run at becoming a professional fiction writer, or forget about it completely. I discussed it with my wife, and we agreed that I should spend a full year doing nothing but writing. I’d just turned 28 years old, didn’t have any kids yet, so it wasn’t much of a risk. After that year, I would reassess my situation and take it from there. I’d been writing in my spare time for years and had even finished a number of novels that I’d tried, unsuccessfully, to sell. I’d also worked for a year as an agricultural reporter/editor for a financial newswire, so this wasn’t exactly starting from square one. I’d been reading horror for years. Many of my short stories (all unpublished) were horror, and the novel I’d just finished was horror, too. Horror was also very big in 1988. Trying to break into the horror market seemed natural. So, I outlined a horror novel and started writing. I spent two months on the first draft, working 8 hours a day, five days a week. Then spent another month revising it. I sent a query and sample chapters to 5 publishers. One rejected it outright. Four wrote to say they wanted to see the entire manuscript. A couple of weeks after that, Zebra Books phoned with an offer, and I accepted. In the couple of months that the novel (“Breakthrough” was my working title) had been “out there”, making the rounds, I’d also been working on another horror novel, and it was almost completed by the time Zebra made the offer on the first book. I mentioned the second (BEASTS), and the editor (Carin Ritter) said to send it right away. I did so. Within a week she phoned back to make an offer on that one, too. So, in effect, my first sale was actually two books. This was May of 1988, 5 months after I’d made the commitment to write. It was a pretty exciting time for me. DEADBOLT: 14 novels in 9 years is a pretty impressive record. How long does it take you to write a novel on average and what’s your writing output like? S.G.: Actually, the 14 novels were written over a period of just over 6 years. My last published novel, NIGHTLIFE, was completed in February 1994, but wasn’t published until September 1996. In the first year, 1988, I wrote and sold 3 novels. BRAINCHILD, BEASTS, and DARK MIRACLE. During that first year, I felt guilty that my wife was out working bringing in all our income, while I was at home playing on the computer, so I made myself treat writing like a job. I got up with my wife, I sat down at the computer when she went to work, and I didn’t stop until she got home. When I signed my first multi-book deal (3 books) at the end of that first year, I relaxed a little, and cut back to working only in the mornings, about 4 hours a day, five days a week. My daughter was born that year, too, so it was sort of a necessity, since I was at home looking after her. And that’s the schedule I’ve maintained to this day. I work mornings, and in the afternoons I do stuff with the kids (three of them now). I cut back my output to two books a year… roughly six months a book, sometimes with a few weeks or a month off between books. For each book, the time is also broken up. I usually spend a month developing the idea into an outline. Two to three months to write the first draft. Another month or six weeks to revise. DEADBOLT: From page one, your novels have a strong sense of story and momentum to them. Do you outline before you write? S.G.: The way I outline has changed quite a bit from when I first started writing. For the novels I wrote before selling anything, I didn’t outline much. I had a vague idea of the story. I’d start writing. I’d try to end chapters on a hook. That was it. When I decided to take writing seriously, I did a lot of reading and analyzing of the books I liked, and came up with what I thought were pretty sound plotting and structure basics. I applied those rigorously to my first few novels, outlining to the point of being silly. I’d do a two or three sentence outline so that I could pitch the idea if I had two. I did a four or five page outline so that I could get a good grasp of the structure and story flow. Then I’d do a detailed structural outline, delineating each of the main dramatic movements. Then I’d do a detailed chapter outline, with the scenes now placed in their proper chapters. Then, I’d do an expanded Chapter Outline, basically writing the book, but only one page per chapter. At this point, I knew exactly what was working and what wasn’t. Then I’d sit down and write the book, and by this time it was basically write-by-number, since the whole thing had been pretty thoroughly pencilled in. The benefit of this kind of outlining is that you discover a story’s flaws before you invest a lot of time writing the first draft, and it’s almost impossible to get stuck at a difficult chapter, because you’ve already done the work to push through those kinds of blocks. The downside is that you’ve outlined so thoroughly that the actual writing can be a bore, and that can come through in the writing. It wasn’t a problem the first few times, because the whole process was so new to me, and to be fair, the books always broke the outline, no matter how thorough I’d been and I’d have to re-outline at the midpoint and before starting the resolution. But it did become a problem, and caused me to change tactics after awhile. By the time I wrote NIGHTLIFE, I outlined only so far as determining the basic story structure, dramatic movements. A few key scenes, the ending. Then, every day when I sat down to write, I’d take some time to determine what scenes I needed to write that day, maybe the next day. That turned out to be the most fun I’d ever had writing a book. It was probably the closest that writing has been to reading… with the story unfolding as I wrote. It was quite suspenseful. I couldn’t wait to sit down the next day to find out what was going to happen. DEADBOLT: Who would you cite as some of your influences? What are some of your favorite novels? S.G.: I’ve been reading horror since I was five years old. I started with a book called Scottish Tales and Legends, which was full of witches, banshees, kelpies, and the like. That book shaped my whole reading experience, and the course of my writing career. Add Blackwood, Poe, James, Lovecraft, when I was a bit older, usually found in school reading books. When I was a teenager, I got into SF, quite heavily, and that too has had a major impact on my writing. Many of my novels, though marketed as Horror, are actually SF novels in disguise. BRAINCHILD… a radical audio-cue psycho- therapy. BEASTS… a mutated rabies virus. DARK MIRACLE… agricultural genetic manipulation. Of my novels, only 5 are what I’d call outright supernatural stories. The rest have either an SFnal premise, or are naturalistic. 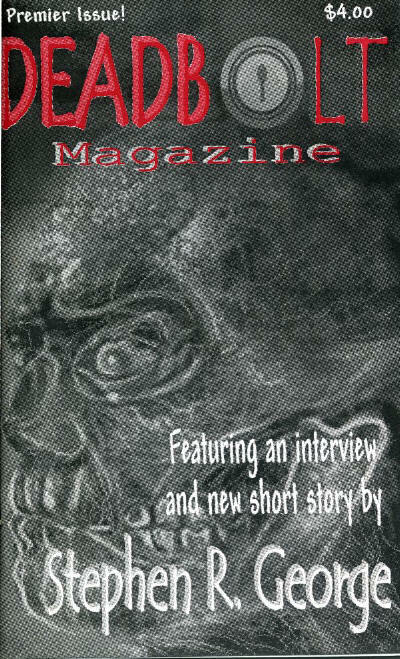 DEADBOLT: You’ve had short fiction published in HOT BLOOD: Seeds of Fear, DARK SEDUCTIONS, and Cemetery Dance. (“How it Happens” in CD is a personal favorite of mine.) But your short fiction output is small compared to your novel writing. Why is that? S.G.: As I’ve said, I’ve always treated writing as a job (albeit a job I really enjoy,) and short stories don’t pay the bills… although the story in DARK SEDUCTIONS came close. As well, short stories are hard to write. 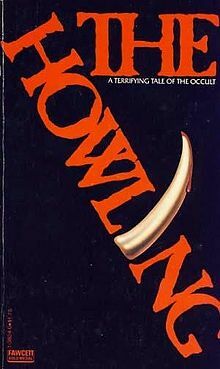 I’m a fan of short horror fiction… in fact, the most memorable horror I’ve read is of the short variety… but I have a hard time pulling it off myself. 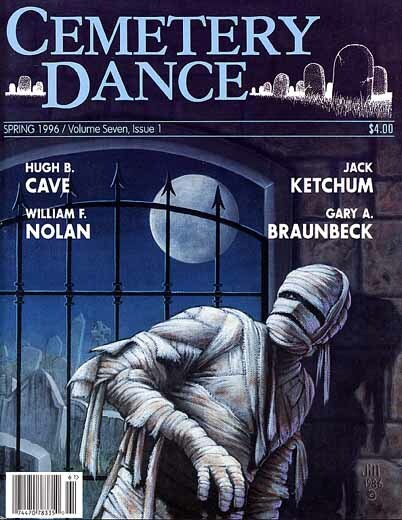 On the other hand, now that I’m not dependent on fiction for my income, I’ve been writing more short stories despite the fact that there’s no real paying market for short horror other than Cemetery Dance. I haven’t tried marketing them yet, but I’m gearing up to it. 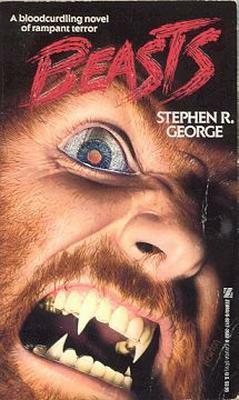 DEADBOLT: It’s been awhile since readers have seen a new Stephen R. George book on the shelf. Anything in the works? S.G.: Something is always in the works. I’ve got a near complete horror novel at my desk, plus a number of short stories, plus preliminary outlines for two other novels. I’ve devoted a lot of my time and effort during the past few years to developing my advertising copywriting business to the point of where I can support my family and don’t have to depend on writing fiction for my income. DEADBOLT: And we’re looking forward to it also, Steve!